“For the last 10 years since I’ve been a professional, I’ve been dabbling with drums from German maker, Christian Hedwitschak. While I have played many drums over the years, I always keep coming back to the Hedwitschak drums. Rim: Solid beech layers with fiddle bottom maple. After much fighting (which I won) the drum comes with a bar on the inside, a controversial move, but, it can be removed with ease, just 4 small screws if it’s not for you. I’ve ALWAYS preferred to have a bar, to me, it’s not restrictive. If it’s far enough from the skin, I find it really helps with stability and leverage for tone. I know I’m one of the few that like it, but it’s worked for me so far. I have always preferred to play a Lambeg skin, it has a bit more attack and can take the kind of high-tension that I like for concert performance. At the same time it has plenty of low-end range and bass warmthif I choose to tune it down to play sessions or acoustic. The tuning system is designed especially for high-tension, a brand new Hedwitschak System JUST FOR ME!! YEEEEOOOO. It’s a 5 tuner system. It’s the perfect amount if you need to tune during a performance and the ease of travelling without a tuning key or screwdriver is the only way to go! 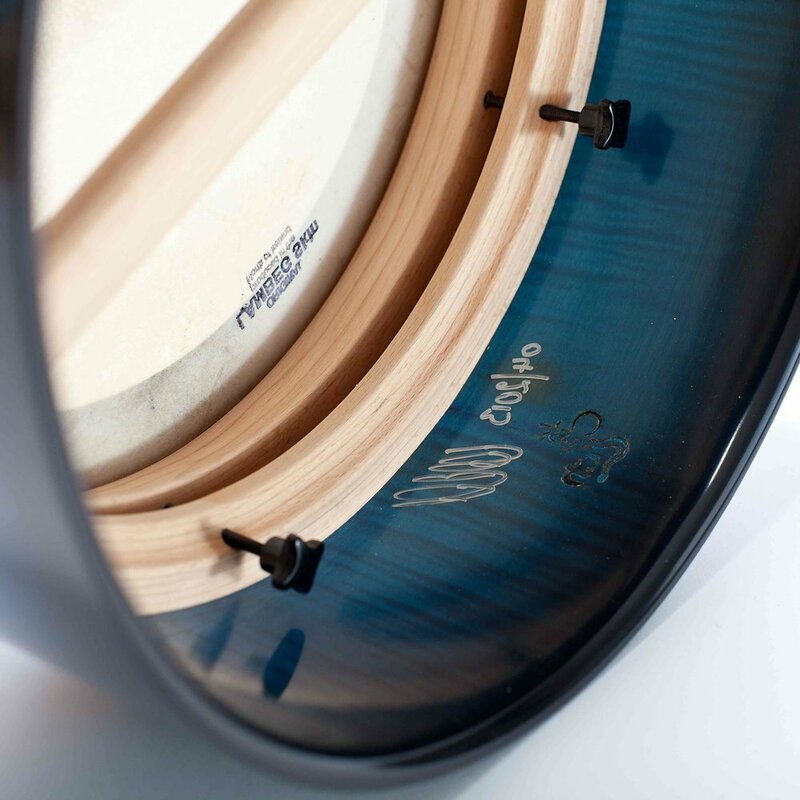 The tuning system is designed to be able to have the drum at a high-tension and hold it there if that’s what you need. This is ideal for me as I require a tighter drum for speed and need it to be able to stay tight during a gig without too much tuning. It gives me great pleasure to now be able to offer the E.M Coreline from eamonmurray.ie. A lovely little drum for those of you who maybe aren’t ready to make the giant leap into a full customised drum. It’s the same dimensions are my regular E.M Sig and delivers an unbelievable sound. It’s clean, simple and perfect for improvers and session lovers. It has the spine of the skin running through the centre of the drum. This part of the skin is slightly thicker and tougher than the rest so you get a lovely attack and high-end, whilst having the warmth and bassy open note.